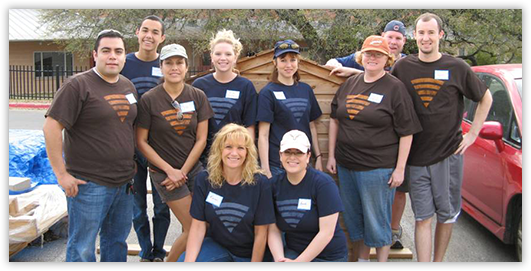 In its efforts to engage with the central Texas community, Amplify Credit Union has long stressed involvement with local charitable organizations, especially those that emphasize improving the lot of the less fortunate. To encourage its team members to get involved, Amplify allows them 40 hours of paid time per year to dedicate to their favorite volunteering activities. Of course, many team members go above and beyond this allowance, giving their time and money to a number of worthy causes in and around Austin. If you’re an Amplify Credit Union team member, Senior Human Resources Generalist Jenny Voigt wants you to get involved with volunteering, much as she has herself. As the United Way coordinator for the credit union, she knows first-hand the efforts Amplify has made to encourage a volunteer culture in the work place. Jenny has been instrumental in getting Amplify team members involved in several United Way projects, including a clean-up day at Umlauf Sculpture Garden spent tidying up the grounds, a playground refurbishment at SafePlace, and a computer deconstruction project for Good Will Industries. For her own volunteering, Jenny is involved with Family Eldercare, an organization dedicated to keeping senior citizens connected to society and able to live full, independent lives. The inspiration to become involved with Family Eldercare came to Jenny from within her own family. Family Eldercare provides social interaction for those who might be otherwise isolated. They make frequent calls to those in the program to make sure their needs are being met. Often, though, it’s just a call to say hello and remind them about daily activities such as phone Bingo and to let them know that there are still people in the world who care about them. Jenny calls about 25 such individuals on a regular basis. Participants are also encouraged to interact with one another through a program called Lifetime Connections Without Walls in which they discuss a variety of topics and take part in mind exercises and games. 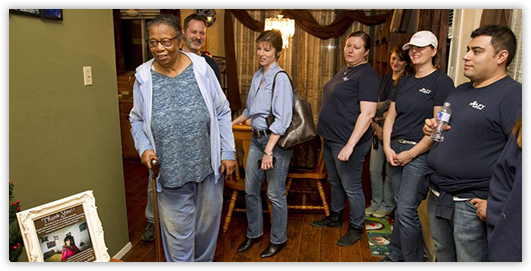 It was through Jenny’s work with Family Eldercare that a connection was made with Ethel Black, one of the beneficiaries of Amplify’s participation in the Austin American-Statesman's 2013 Season for Caring program. Jenny has also volunteered with Habitat for Humanity and the Capital Area Foodbank in Austin. Her philosophy on volunteering is one well worth considering. Want to get involved with Family Eldercare? Learn more about all the ways you can volunteer, donate, or even fundraise with Family Eldercare.